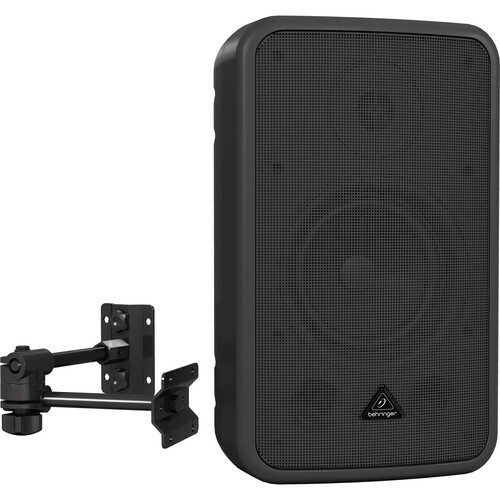 The CE500A from Behringer is a high-quality multipurpose speaker, ideal for use in retail venues or as a home studio monitor or multimedia speaker. The compact design and included mounting hardware make it easy to discreetly install the speaker virtually anywhere. Box Dimensions (LxWxH) 16.0 x 10.0 x 10.0"
CE500A 80W 2-Way Multipurpose Speaker (Black) is rated 4.0 out of 5 by 2. Rated 4 out of 5 by SteveG from Great Speakers Great versatility with multiple inputs. Great sound for a small speaker. Ideal for monitoring soundboard for our TV ministry. Mounting brackets could be more adjustable. Rated 4 out of 5 by Chris from So far so good! Simple to use and loud enough to be heard over the music in the restaurant.